As Halloween approaches and the phone starts ringing for the fancy sugar skulls, detailed body paintings, and over the top requests for Halloween costumes your mind starts thinking if it’s time to invest in an Airbrush system. I am here to offer some advice and suggestions on whether or not using an Airbrush will help, or hurt your pockets. I have a lot of experience with both mediums 1) because I sell a lot of both and 2) because I have used both over the past 10 years to service my clients and I can explain the pros and cons. I hope info will help you prepare for a PROFITABLE busy season. Paint on top of silicone -If you are planning on using Silicone for prosthetics or to create specials effects an airbrush is ideal because alcohol based make up covers the silicone without beading up. Regular water based make up does not cover or paint on top or silicone appliances so using an alcohol based ink will be a preferred method for a smooth make up application. 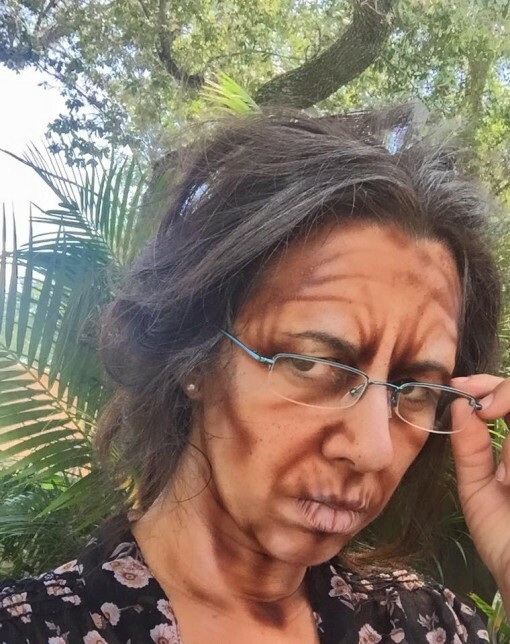 Our favorite girl Marcela Bustamante showcased her skills after watching Jay’s class on aging she rocked it! Because an airbrush creates a hazy line, its easier to get a soft blended edge and fade out the color. Where if you used your water based make up you would need to blend out the edges and contour with 2 colors in order to get a similar effect. Time saver (sometimes)- I have only done make up for an actual haunt during busy season one year. I have been too busy since that time because the store is super busy during Halloween. 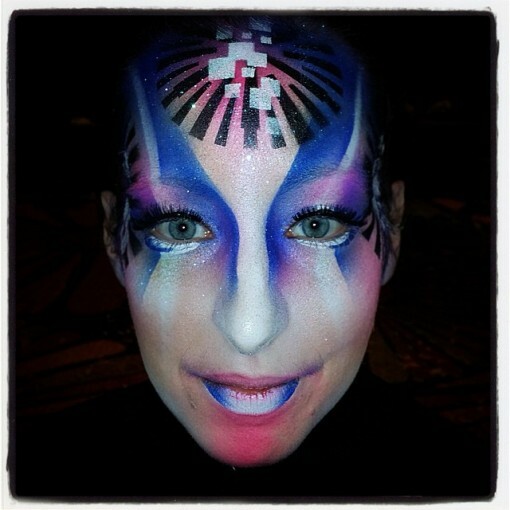 But I found that using my airbrush for face painting, and applying haunt make up was a time saver. I was able to cover the face in a fast base coat in under 2 minutes with very little blending and even coverage. Depending on the make up you are using, it also dries very quickly which is a PRO when you are using stencils or applying layers. 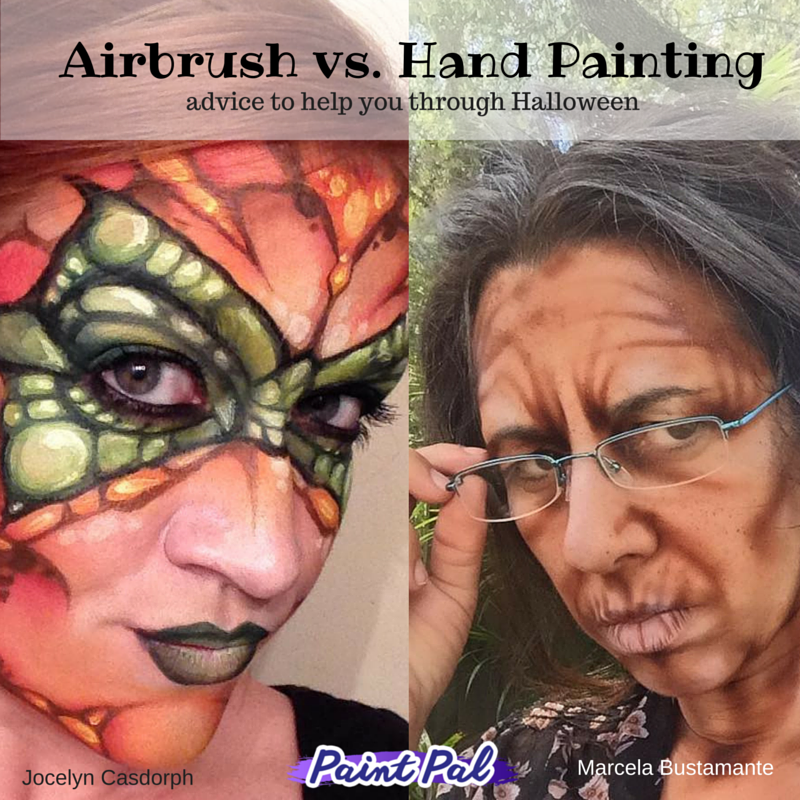 I will explain later why I do not feel airbrushing is a time saver when it comes to body painting, but with regards to face painting, it did help move faster and cover prosthetics. Options for longevity: Unlike with water based make up, you have choices and options when it comes to Airbrush make up. 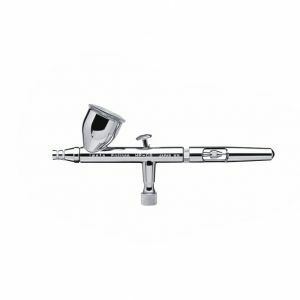 There are lots of different types of airbrush make up ranging from water proof (known as Inks) to semi waterproof (known as Hybrid, to water based make up that removes easily with soap and water. So when you are trying to decide how to provide your customers with the best service and make up you have choices how to make that happen. Alcohol based make up is meant to be waterproof so for the longest lasting wear its a good option especially for profuse sweaters, and those that want to wear their designs all day. But remember, alcohol based make up contains alcohol and is not recommended for sensitive skin or younger clients because you have to remove it with an oil based remover or alcohol. Hybrid make up is in the middle between a water based paint and an alcohol based paint. It holds up stronger than a water based but still removes with soap and water making it a great alternative to ink. Then only downside to using a hybrid make up is that it can not be thinned so if you are using a small airbrush .03 or smaller it may be hard to spray through your airbrush. Water based make up is pre mixed and very similar to water based cake make up. 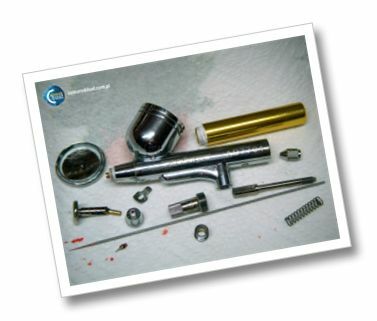 The benefit is that you can get the style and effects of using an airbrush with the ease of cleaning and application. Very limited detail- Depending on your skill level with an airbrush you may still need your paint brushes. As I explained, airbrushes can not create an exact straight line and it takes a skill to be able to get hairlines. So if you want to create very detailed designs or single out a hard to reach area it can be very difficult using an airbrush. Most painters like to use a top feed Iwata Revolution to apply the make up. You load the paint through the top of the gun, but if you are trying to get inside a crevice or weird angle you run the risk of spilling the paint. So, chances are if you want real detail you will still need to use your paint brushes. Cost is always an issue– Unless you are super rich then you are always thinking about cost of materials. For the longest time body painters were using createx t shirt and fabric paint for airbrush body painting because it was cheap. 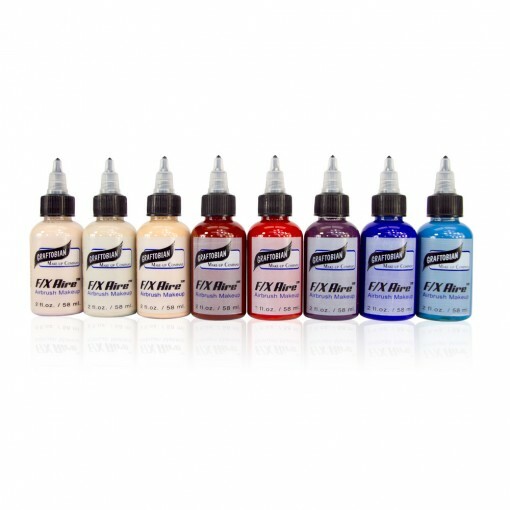 Pre mixed vibrant airbrush make up is not cheap. On average pre mixed make up ranges from $12 for 2 ox to $40 for 4 oz. So if you plan on doing a multicolored design you might need to invest hundreds of dollars to have enough paint and colors to execute the design. 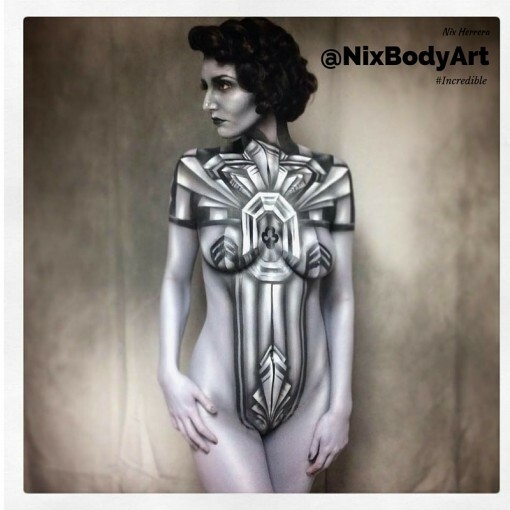 As a rule of thumb it takes between 3-4 oz to cover a full body in airbrush make up so plan accordingly. So if you are on the fence about investing in a system to maximize your Halloween services hopefully this article shined a light on some of the pros and cons. I am always trying to help save you time and money. If you still need advice as always give me a cal or email me I am always happy to help.